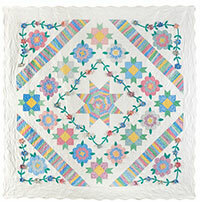 This month, we learn all about the folded flowers and bias stem applique on the Ruby’s Garden block of the month quilt. Jenny shows a neat trick for threading a hand-sewing needle without any special tools, then demonstrates making the gathered petal flower, the round petal flower, the pointed petal flower, and the center yoyo for each flower. She also shows how to make the bias applique stems and how to add them onto the borders.